It is Breast Cancer Awareness Month, so there’s no better time than now to look at a new study about those who’ve survived the disease. It found that over 40% of older breast cancer survivors don’t maintain a high enough fitness level, and exercise is very important for long-term health. The key to staying with it, even after enduring the hardships of cancer: confidence and motivation. Big-time health advice for survivors is to get regular exercise. Why? It reduces the risk of breast cancer recurrence, and even death, due to breast cancer. 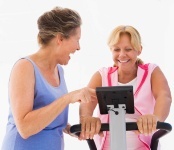 In the new study, researchers in Oregon tried to gauge the benefits of a 12-month supervised exercise program in 69 older breast cancer survivors. The goal: figure out what factors influenced people’s ability to keep exercising after the program ended. Breast cancer survivors with higher self-efficacy, or confidence to overcome exercise-related barriers (such as being too tired), were far more likely to continue exercising on their own. Those with higher self-efficacy scores were 10% more likely to be physically active six months later. The good news is that self-confidence can be taught, and gained. Survivors can enlist the support of family and friends, as well as identify and overcome whatever barriers to exercise are stopping them. While exercise is crucial for us all, it’s even more so for cancer survivors. Staying fit helps reduce common side effects of cancer treatment, such as fatigue, depression, decreased muscular strength, and weight gain. The weight gain is important, because putting on too many pounds after treatment increases the risk of breast cancer coming back. One idea is to find classes that include cancer survivors, even taught by them. Then, you have the camaraderie and understanding, and are more likely to stick with it. The researchers said another idea is “counter-conditioning.” This means substituting a positive behavior for a problem behavior, such as taking a walk whenever feeling stressed rather than stuffing your face with comfort food. When you do transition to being on your own to keep up with exercise, it’s a good idea to commit to a specific activity schedule. Make those activities enjoyable, so you stick with them. If you hate certain exercises, just forget them and concentrate on the ones you like. If you have people in your life that can encourage and support you, that can go a long way as well.